In terms of societal goals, reducing childhood trauma is something we could probably all agree upon. One of the ways that researchers have measured childhood trauma is by looking at the number of different types of traumatic events that a child experiences. 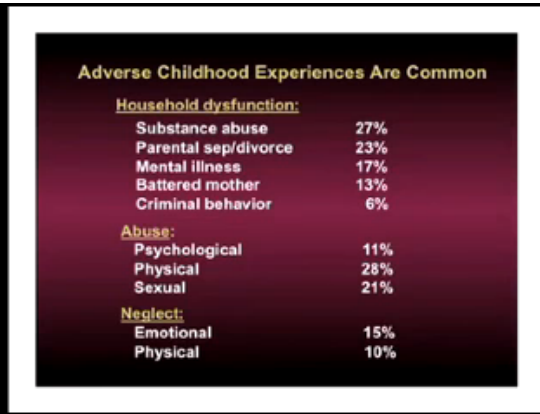 These are termed adverse childhood events and given the acronym ACEs. 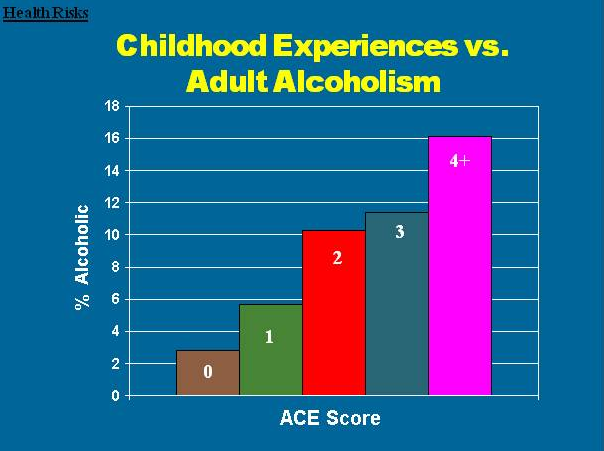 One of the things that has been surprising is the shear number of ACEs that many people experience. In the course of a study conducted at a Kaiser Permanente intake facility in San Diego (generally consisting of people with insurance, so these are mostly people with decent jobs), it was found that 1 in 8 people had experienced 4 or more different ACES in their life and 4 ACES is the point at which the association with health impacts becomes dramatic. This is only looking at the number of different ACEs, and not including the severity or duration of any one of them! The researcher that developed the idea that lead to the 17,000-person study on the subject was at the helm of an obesity clinic at the time, wondering why so many of his patients who had lost over 100 pounds and were on a good trajectory were dropping out. He ended up discovering that the majority of the patients in his clinic had previously been abused. Overall, we are learning that a huge factor in the predisposition towards chronic disease lies in the mental/emotional realm. Dr Klinghardt believes that mental/emotional issues create a weakness in the body that allows toxicity to develop and this toxicity provides nourishment for pathogenic microbes (chronic infections, viruses, lyme, etc). A large part of my practice is helping people to overcome these mental/emotional hurdles. This is something that needs to be done very carefully, as some forms of therapy that involve “reliving the trauma” have the potential to re-traumatize the patient who is trying to relieve the problem. Among other things, I utilize craniosacral therapy, which seems to have the power to release what is being held from the body without subjecting the patient to any additional stress. Thankfully Washington is leading the nation in promoting this knowledge and using it to shape the approach of staff within the public school system, but this should really be something that is talked about universally.